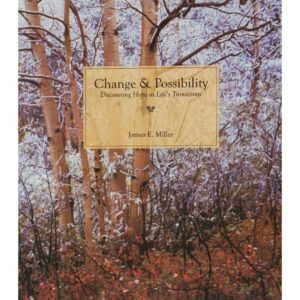 [by James E. Miller; Willowgreen – 2005] James E. Miller brings insight and compassion to this exploration of the experience of change that is a part of all human life. Intriguing and inspiring quotations from many traditions add depth to the wisdom that is shared. The author’s beautiful full-color nature photography appears throughout the print version of the book, accentuating the truth of the three universal phases of all human transition. Each of the chapters is followed by a list of affirming suggestions for going through the various parts of the transition experience. The journey is not exactly alike for everyone. Transition takes as long as it takes. It can be a very challenging time, one you don’t look forward to. Yet it can also be an immensely rewarding time, if not a life-changing experience. For all the changes, however, you’ll learn something more: you’re not alone. Whatever leaves you, something, or Someone, always stays.